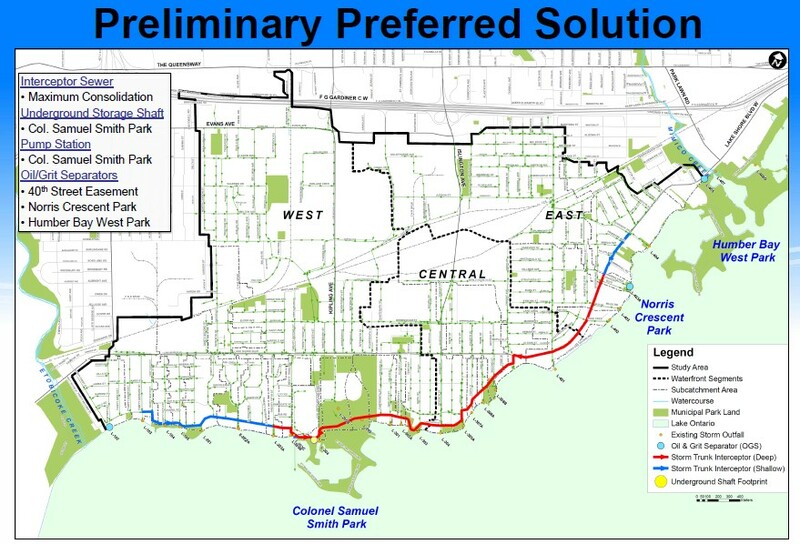 Last Thursday, during the concluding phase of the Environmental Assessment, the City and its consultants unveiled the Stormwater Management Plan for South Etobicoke. 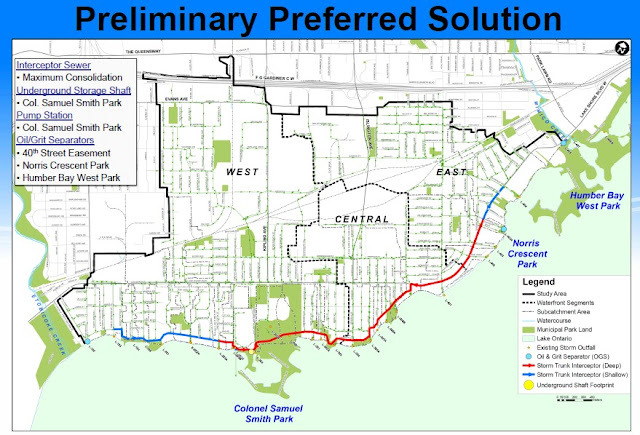 As expected, they intend to go with the “big pipe, big shaft” solution in Sam Smith Park that we all felt they were set on right from the get-go. If you weren't there, the presentation can be viewed on the City's website. As part of the long assessment process, there have been public meetings and smaller consultations with the Community Working Group. In spite of assurances still coming from the Councilor’s office that the community is in favour of this expensive, highly engineered solution, there has always been unanimous preference from the community in both forums for naturalized processes for dealing with storm water (“preference for naturalized facilities and enhancement of existing habitat” – the planners’ own words) - for more resilient, decentralized forms of management like source infiltration, ponding and wetlands that would create ecological assets for vegetation, urban wildlife and human enjoyment rather than last-century, concrete and metal, big–pipe thinking. In spite of them asking over the years what the community wanted and being told, there is no incorporation of any natural feature whatsoever in their plan – not even a trickle of runoff added to the rapidly dwindling North Creek in Sam Smith that feeds our wetland and provides a movement corridor for birds and mammals! Ponds for handling storm water are commonly used in subdivisions around the GTA now and, of course, we have the example of Sherbourne Commons in the East Side of the City where storm water flows through an artificial wetland, an urban river and art features before entering the lake. A quick internet search reveals innovative examples from all over the world. 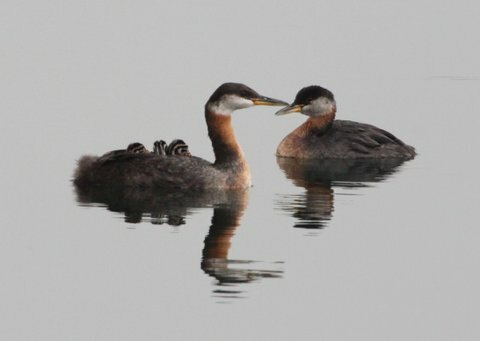 There is room for wetland expansion at Sam Smith and, if the flow was decentralized, at other waterfront parks along the shore – Marie Curtis, Rotary Park, Cliff Lumsden, Prince of Wales, Amos Waites and Humber Bay. 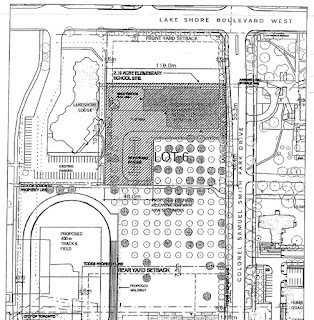 The issue for Friends of Sam Smith Park is that, while applauding efforts to clean up the lake for wildlife and aquatic vegetation, there is little emphasis on source solutions (only 10% of Toronto Water's budget for stormwater management) like bioswales in parks and around parking lots, permeable surfaces and so on to reduce the flow that ends up at the lake, and no use of end-of-pipe stormwater for habitat enhancement or water parks for human enjoyment. 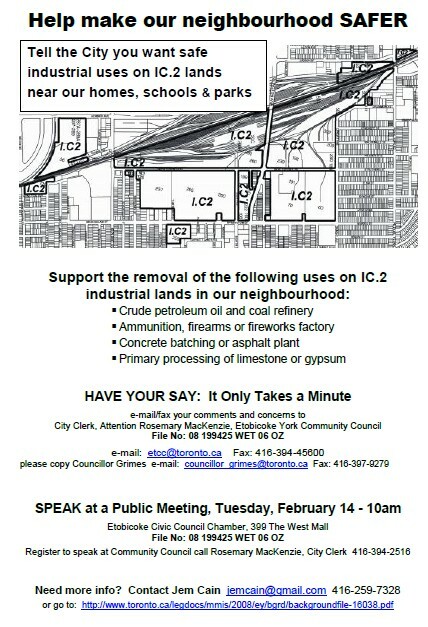 There is little imagination in this plan and there will be no assets for the community. Another "dog and pony” show! This morning Terry Smith, FOSS's Acting Chair, Jem Cain, Ruth Grier and Brian Bailey from CCFEW met with the TCDSB Project Co-ordinator for the new Catholic School and the Architect who will design it. 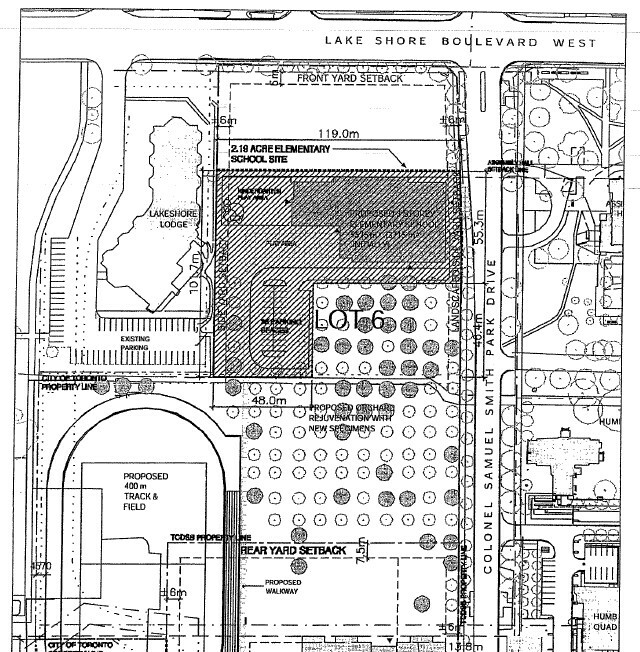 The school will have three storeys and accommodate about 550 students on a rather small 2.19 acre site at the north west corner of Colonel Samuel Smith Park Drive and Lakeshore Blvd. West. There will be a large setback from Lakeshore. It should be completed late 2014 or early 2015. Both FOSS and CCFEW emphasized the need for the design to be in harmony with the natural features of the park to maintain (and, hopefully, enhance) ecological integrity, particularly with regard to wildlife movement corridors, habitat protection and the opportunities a naturalized Sam Smith Park offers for environmental education. Our concerns and asks were met with respect and interest. We look forward to seeing them implemented in the final design. Here is a list of what was discussed.